Although mediation can be a complicated process that involves a series of steps and a variety of stakeholders, we aim to make it easy for developers. To further that end, we are pleased to announce that publishers on Fyber SDK 8.9+ now have access to our helpful self-service mediation test suite. No single ad network can fill the breadth of supply created by our publishers, nor can publishers manage the multitude of direct deals required to work with each network individually. This is where Fyber mediation comes to the rescue. With just one easy-to-integrate SDK, developers gain access to a variety of demand sources while maintaining commercial agreements with each of those partners. 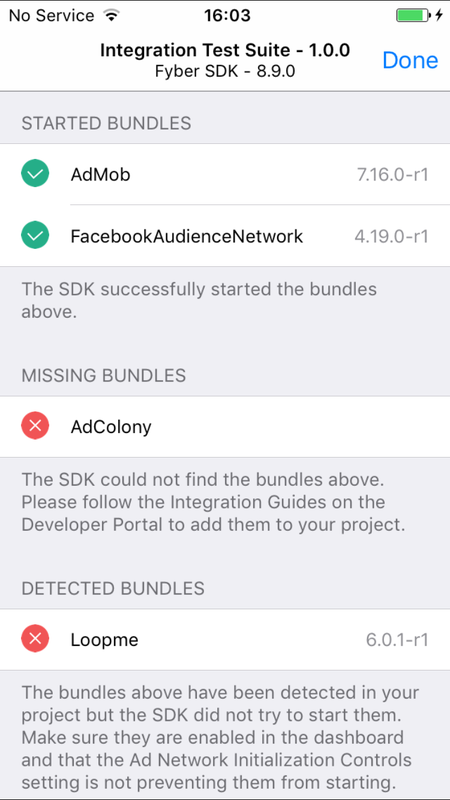 In addition to detailed documentation and Fyber’s technical services team, we now provide an additional way to ensure a smooth SDK integration before submitting your app to a store. With the new test suite developers have the ability to check the state of an integration at any point, either through a view controller on a mobile device or via an API that allows for automated testing. By testing integrations, you guarantee that all networks remain a viable ad source, which in the end will increase eCPMs and help drive additional revenue to support your business. This is helpful at any point – whether integrating the Fyber SDK for the first time, upgrading to a new version of our SDK, or simply adding further ad networks. This self-service tool enables our valued developers to spend less time on QA and more time on a monetization strategy that helps their business thrive. At the end of the day, developers want their app in the marketplace earning ad revenue, not sitting idle in app store purgatory.